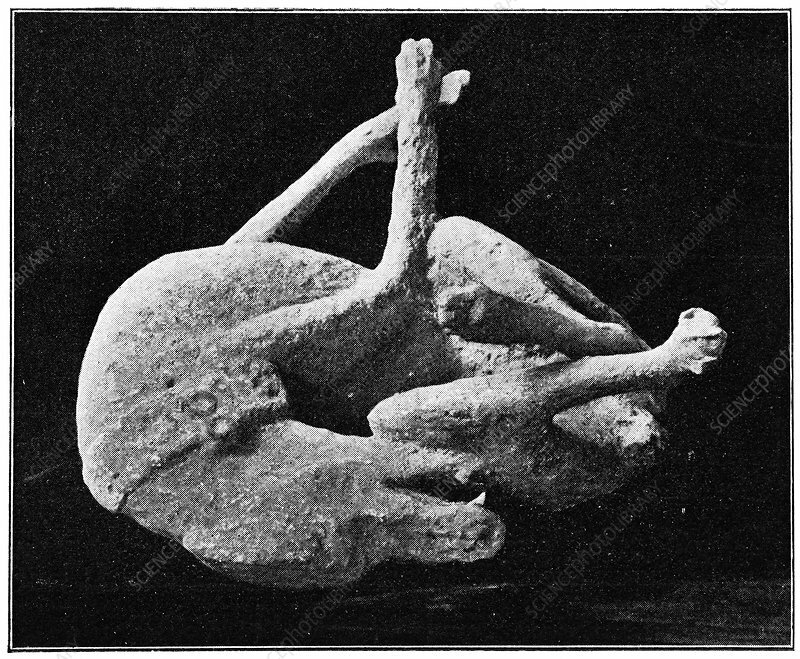 Plaster cast of dog from Pompeii, historical artwork. The Roman city of Pompeii, located in the Bay of Naples, Italy, was ruined and buried under thick layers of ash during an eruption of the volcano Vesuvius in 79 AD. Many were killed by falling buildings or other causes, such as poisonous fumes. The city was rediscovered and excavated in the 18th and 19th centuries, revealing much about the Roman way of life. The remains and impressions of over 1000 victims have been found within the ash deposits, along with animal remains. Artwork from the third edition of 'Les Entrailles de la Terre' (1902) by French author Eugene Caustier.